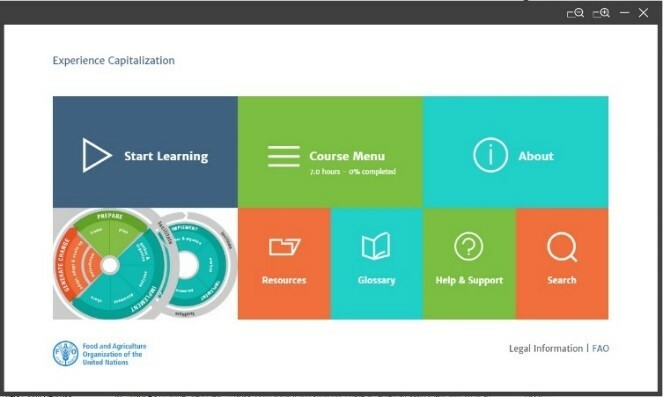 Several months ago, FAO launched its experience capitalziation e-learning module, which is now available in different languages. As all its courses, this contains a mixture of rich content, targeted learning strategies, dynamic screens, interactive tests, exercises with reinforcement feedback and illustrative case studies – targeting novice learners and also experienced professionals wishing to update their skills. 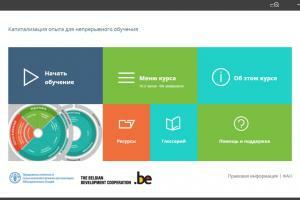 This one, and all the e-learning courses are modular and suited to “just in time” learning. Readers can take a specific lesson whenever they need or access it at their own pace and according to their schedule. And in addition to the e-learning materials, readers will find links to online resources, recommended reading, self-study tutorials, checklists and wide-range of job aids. Experience capitalization is a methodological process through which an experience is identified, analysed and documented, leading to creation of knowledge (for example good practices or lessons learned), which can be shared and used to generate change. This course introduces the methodology and process of experience capitalization. It gives you guidance and tools to help you plan and implement your own experience capitalization process, and ensure its efficiency and effectiveness. The course aims at providing organizations working in development programmes with the necessary tools and skills to plan and implement an experience capitalization process, and contribute to increased efficiency and effectiveness of their work. The learning programme will create awareness about the conditions and requirements for such a process, and an understanding of the steps to follow. In particular, through the learning programme, learners will identify or acknowledge the value of experience capitalization in their work, build skills to use experience capitalization in their work, be able to use and help others use experience capitalization. 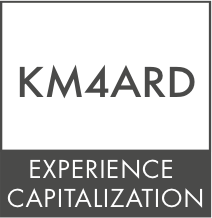 Lesson 1.1: Why learn about experience capitalization? Lesson 1.2: What is experience capitalization? Этот курс представляет методологию и процесс капитализации опыта. Он содержит рекомендации и инструменты, которые помогут вам спланировать и реализовать свой собственный процесс капитализации опыта, а также обеспечить его эффективность и результативность. Этот курс направлен на передачу необходимых инструментов и навыков для планирования и внедрения процесса капитализации опыта, а также для повышения эффективности и результативности работы организациям, работающим в программах развития. La capitalización de la experiencia es un proceso metodológico mediante el cual una experiencia es identificada, analizada y documentada, conduciendo a la creación de conocimiento que puede ser compartido y utilizado para generar el cambio. Este curso introduce la metodología y el proceso de capitalización de la experiencia. Ofrece orientación y herramientas para ayudarle a planear e implementar su propio proceso de capitalización de la experiencia, y garantizar su eficiencia y eficacia. La capitalisation d'expériences est un processus méthodologique par lequel une expérience est identifiée, analysée et documentée, et qui aboutit à la création de connaissances qui peuvent être partagées et utilisées pour générer des changements. Ce cours présente la méthodologie et le processus de la capitalisation d'expériences. Il offre des conseils et des outils qui vous aideront à planifier et mettre en œuvre votre propre processus de capitalisation d'expériences, et à assurer son efficacité et son efficience.